Today was a rather weird, slow-motion day at work. Flurries of activity intermingled with intense periods of "omgwhyisitnotfiveoclockyet," which made some of us rather grumpy. 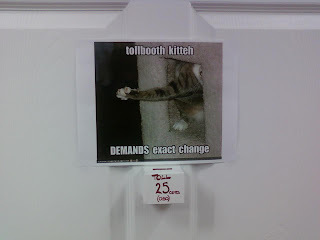 Attempting to cheer myself up, I decided to put some helpful guidance on one of my office doors (I have two). See, some folks like to use my office as a breezeway or shortcut to visit people in the area beyond. This behavior aggravates me because I'm a writer, and as such I like to concentrate on what I'm writing. Concentration is difficult to attain when someone stomps back and forth through my room, so I decided to post this sign. One of my lovely coworkers added the collection box. (Thanks, Joanne!) 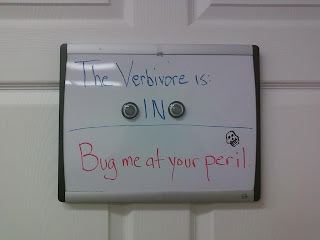 Feeling that this sign wasn't enough, because Jerky McLoudphone could approach from the other direction, I hung a nice dry-erase board on that side of the same door. Assuming this doesn't get me in trouble, I'll be able to write in peace tomorrow. Hope springs eternal.